Michael Thomas spent the past year and a half on the 49ers practice squad until last Monday. Tom Brady knows how to exploit a mismatch like no other quarterback in the league. The unparalleled hours the 14-year veteran spends in the film room tend to pay off on Sundays. That’s why when the Dolphins inserted cornerback Michael Thomas into the game with 1:13 left in the fourth quarter, Brady recognized it immediately. Thomas, who began the week humbled as a 49ers practice squad player, ended it screaming in euphoria with cameras in his face and new teammates embracing him after an unforgettable NFL debut with the Dolphins. Life as a practice squad player isn’t glamorous. When you have the chance to play on a 53-man roster in the NFL, you jump at the opportunity. After last week’s 49ers’ win over the Seahawks, Thomas celebrated with a night out. When he returned home Sunday night, he set his phone on silent and decided to catch up on some rest. Thomas sprang into action. He returned his agent’s phone call and expressed interest in joining Miami. Moments later, Dolphins general manager Jeff Ireland was on the phone informing him of the situation. The Dolphins needed to add some depth to their secondary. “[Ireland] tells me there’s a flight for me waiting at 2:30,” Thomas remembers. “I accept it. I make that hard decision and call coach [Jim] Harbaugh, [general manager] Trent Baalke and [defensive coordinator] Vic Fangio and let them know that I was leaving. Thomas would spend the next six days catching up on terminology and understanding the defense’s scheme. The long hours with Dolphins defensive backs coach Lou Anarumo helped, but instincts and years of experience would determine the outcome of a few game-altering plays. The Patriots, who were without tight end Rob Gronkowski and wide receivers Kenbrell Thompkins and Aaron Dobson, had all three timeouts, Brady at the controls and only a four-point deficit to overcome. Brady wasted no time on the first play and went after Thomas, completing an 11-yard pass to Danny Amendola. Then, targeting Thomas again, came a completion to Shane Vereen. The Patriots called their first timeout. After they regrouped, the Patriots, in typical fashion, began to march into Dolphins territory. Short pass to Amendola for 12 yards. Twenty-four yard catch and run by Amendola. Twelve-yard pass over the middle to Julian Edelman. The Patriots would call their final timeout when they reached the Dolphins’ 14-yard line. “I knew Tom Brady, just because I’m the new guy out there and my first time ever playing, I’m sure [he] was aware, that he was going to come at me,” Thomas said. Sure enough, Brady did, but Thomas was able to jar the ball free from Edelman. With seven seconds remaining and the Patriots facing fourth down, it was do or die. “I took a peek and saw that he was throwing the ball my way,” said Thomas of Brady, who was trying to fit the ball into Austin Collie’s hands. Instead, Thomas jumped in front, intercepted the ball and fell to the turf. “A bunch of teammates jumped on me,” Thomas recalled. “The atmosphere was crazy. It was unbelievable and actually it’s unforgettable for me. I thought about everything I’ve been through. Trying to get in and get signed from the practice squad. 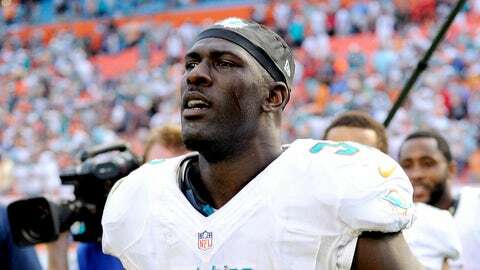 The Dolphins’ playoff hopes received a big boost with their win and they will be watching Monday night’s matchup between the Ravens and Lions with great interest. If the Ravens somehow find a way to win, they’ll have the advantage for the No. 6 seed, but have a daunting task ahead of them with games against the Patriots and Bengals. The Dolphins’ final two games come against AFC East rivals Bills and Jets. Are the Packers still alive? 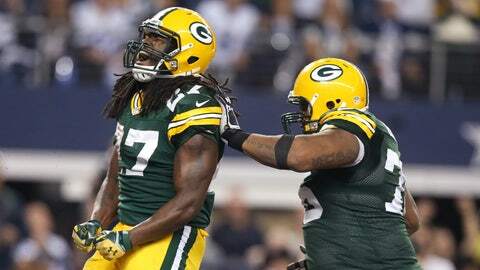 Eddie Lacy rumbled for 141 yards and a touchdown on 21 carries. Thanks to another Tony Romo-led Cowboys meltdown (see below), another team who will be intensely watching Monday night’s showdown is the Packers (7-6-1). Because of their Week 12 tie against the Vikings, they will be able to control their own destiny if the Lions lose. If Aaron Rodgers is able to return next week against the Steelers and get a win, the Packers will be a hot team traveling to Soldier Field for a Week 17 matchup against the Bears to likely decide the winner of the NFC North. If that’s the case, it would be hard to imagine Lions head coach Jim Schwartz keeping his job through the offseason. The NFC North has had well-documented injuries to critical positions, and if the Lions can’t capitalize on this opportunity, when will they ever? The Bears have strung together two straight wins, despite inserting a rusty quarterback in Jay Cutler back to action this week. The emergence of wide receiver Alshon Jeffery gives this offense another added dimension alongside Brandon Marshall, Matt Forte and Martellus Bennett. 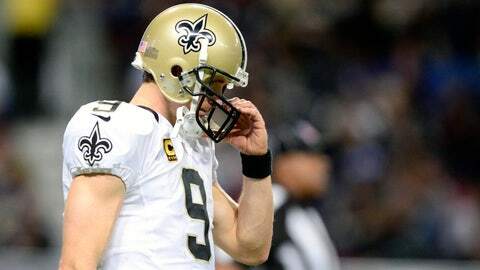 Drew Brees will have a week to prep for a road trip to Carolina. Sooner or later the Saints will need to find a cure for their away-from-home woes. With a road record of 3-4, the Saints travel to Carolina to play a polished Panthers squad after taking a beating against the Rams on Sunday. While the Saints didn’t struggle with the Panthers in Week 14, for some reason they have trouble duplicating their success away from the Superdome. If they can’t take care of business next week, they’ll likely finish as a wild-card team, needing to piece together road wins for a chance at a Super Bowl berth. Sean Payton and Co. have a long week ahead of them. What’s going on in the NFC East? For a division that finished 0-4 on Sunday, the plot somehow thickened. The Cowboys managed to let a 23-point lead slip through their fingertips in a bad home loss to Green Bay (OK, OK . . . by manage we mean Romo threw two interceptions in his final three passes and the Dallas defense let Matt Flynn — MATT FLYNN — throw 4 TD passes). Yet the Cowboys still control their playoff future because they face the Eagles in Week 17. The Cowboys are currently a game behind Philadelphia in the race for the NFC East crown, but Dallas has beaten Philly once already and would own the tiebreaker with a second win over the Eagles. Wide receiver Dez Bryant couldn’t believe it when quarterback Romo threw that second interception of the fourth quarter to cap the Packers’ win. In fact, he walked to the locker room because he couldn’t stomach to watch Flynn take a couple knees and run out the clock. The Eagles had their five-game winning streak snapped and their secondary showed some big-time flaws against the Vikings, who had Matt Cassel at QB and did not have Adrian Peterson or Toby Gerhart at RB. It doesn’t get any easier in Week 16, as one of the most difficult vertical attacks in the league in the Bears arrives in town. 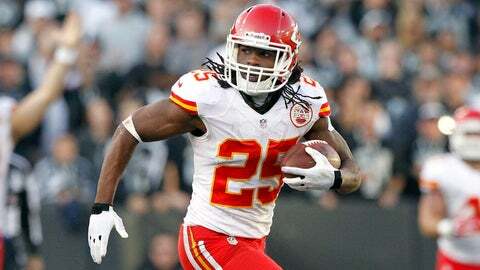 Jamaal Charles had over 200 all-purpose yards and five touchdowns. Jamaal Charles’ five touchdowns punched the Chiefs’ ticket into the postseason. The Colts clinched the AFC South last week despite a loss and were driven to succeed against Houston. Seattle’s secondary picked off Eli Manning five times and don’t show any sign of slowing down without two of their top cornerbacks (Brandon Browner and Walter Thurmond III). San Francisco can clinch a playoff berth with a win against the Falcons next week. While the Cardinals continue to put wins together, they’ll need some big help if they have hopes to play in January.